This is a very simple curry south Indian style. Very easy to make. Heat oil in a pan. add bengal gram and black gram. Fry for a minute. 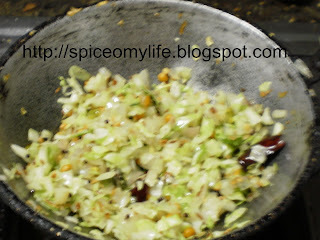 Add mustard seeds, cumin seeds, ginger and green chillies. Fry for a minute. Now add asafoetida powder and curry leaves. Add onion and fry till it turns pink. Now add the cabbage mix well cover and cork for three to five minutes. If required add a little water. When cooked serve hot with rice. It makes good filling for a sandwich too.